OK, it was me. 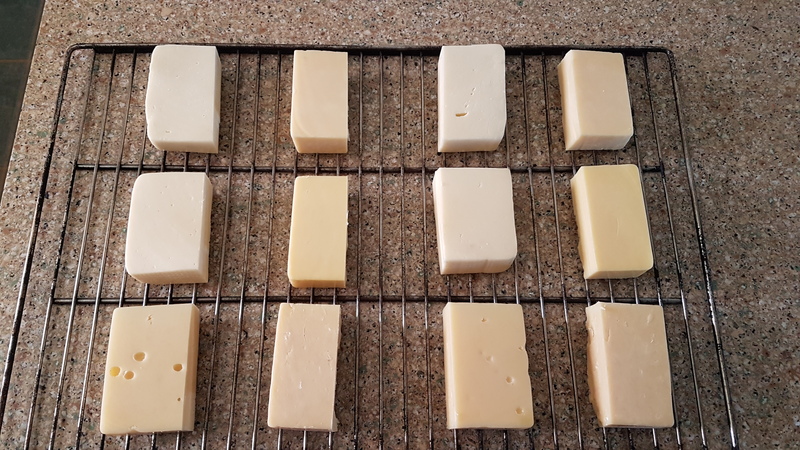 After bluecat's advice I decided to conduct a little experiment in cold-smoking cheese. I put enough apple wood chunks in my Smoke Daddy to fill it about half-full, fired it up and set the air pump to full-blast to really get things going. ...and into the smoker they went. At this point the wood chunks were smoldering well so I dialed the air pump down to it's lowest setting so that it eventually settled down to a nice thin blue smoke. After 2 hours I pulled the 6 half-blocks on the left, vacuum-packed them, labeled them and tossed them in the fridge. (Yes, I know I wrote "2018" at the top of the package. That's a mistake I'll continue to make for at least the next couple of weeks.) The remaining 6 half-blocks were left in for another 2 hours, for 4 total hours of smoke. Then they were given the same treatment. After 2 days of mellowing I'll pull the 2 hour blocks out and give them a taste. If they're still harsh at all they'll go back in the fridge for a few more days at least. If not, I'll taste the 4 hour blocks and make the same judgement call. So...we'll see what happens Sunday after my son and I get back from our last attempt to bag a deer this season. So what temperature are you smoking? 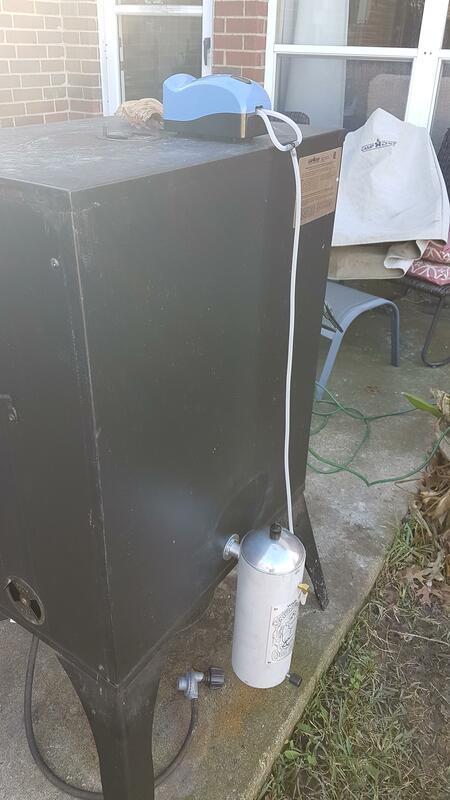 I used an external cold smoke generator and the smoker sits in the shade, so the temp inside the smoker never rose by more than 10°F above the ambient air...which was between 54°F and 58°F for the duration. I knew you were cold smoking just wasn't sure how much temp was increasing if at all. 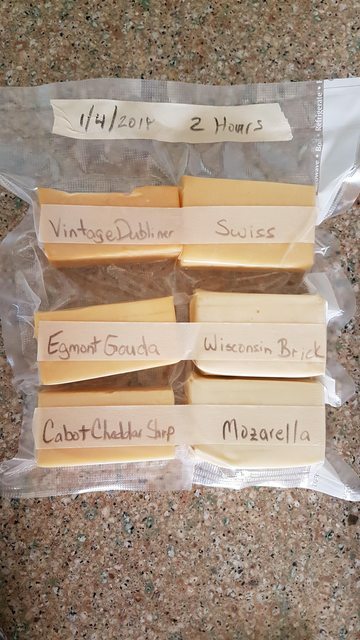 I have to do mine around freezing just to make sure cheese doesn't get too warm. 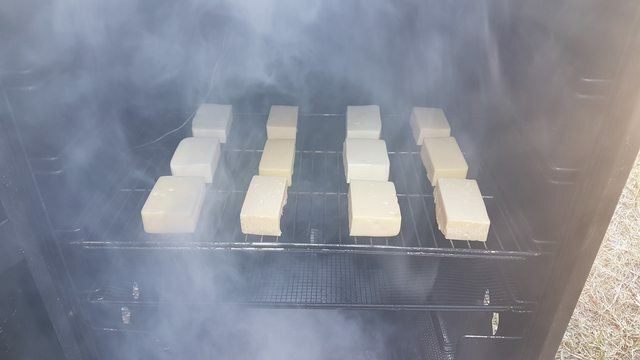 I had that problem when I tried smoking some cheddar curds using my pellet tube without the smoker burner lit at all. The tube generates enough heat on its own to reduce cheese to gooey puddles. But having the smoke generated externally in conjunction with keeping all the smoker vents opened prevented any appreciable heating at all. The next cold weekend I think I'm going to try it out on some salmon. So you're telling me that I'm smoking it wrong? "It's not for eatin' ... It's just for lookin' through ..."
Must still be deer hunting.